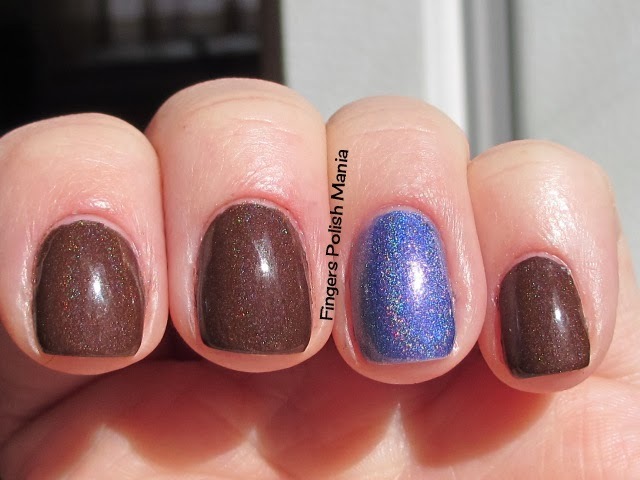 I told you last post that I had to redo the gel from the thickness I had done while on vacation. It just popped off in chunks near my cuticle. My nails needed serious shaping anyway. I picked off what I could and filed down the thick gel layer and then did a major filing shaping fest. Total squares as I have always strived for. I then did just a thin layer of topcoat gel and sealed the tips as well. Then I polished real fast because I had my very first medical facial to get to. I had been waiting for two weeks for this and was very excited for it. I got there and the first thing she did was cleanse my face. Normal. Then she took a razor blade and SHAVED my face. Yup, it's called dermaplane and it takes off the facial hair and the top layer of skin. This helps with product absorption. Now I have always had a ton of baby fine facial hair-especially on my cheeks to my hair line. This was a very weird sensation having her shave my face. Weird. Next, since I have acne and lots of scarring, she applied two different acids to my face. The first one was ok-but the second one burned like fire-yes tears came to my eyes and after a few seconds, I was like ok that's enough-she used some wandy thing to zap all the bacteria as well as cool the acid burn. I did not like that part, but understand the necessity of it. This prompts the skin to flake and rejuvenate itself, getting rid of the scars. The rest was all good. Different masks and massages and yeah it was awesome. My chin is a peeling, dry mess-but as the new skin is growing, I see less scarring already. I have a ways to go-the next facial is in a month and she said more acid and dermabrasion next time. Hopefully now that I know the burn is coming, I won't cry like a damn baby! I am using the products she recommended as well as new mineral makeup, which I really like. I'm not used to the new moisturizer yet, as I am used to the thick creamy stuff and this stuff absorbs right in, which is good, but I don't get that same feeling as I'm used to. But I'm dedicated to these new products and want to give them a chance. Again, no nail art for today, but you will see my new nail shape. Here is the silly bottle shot. 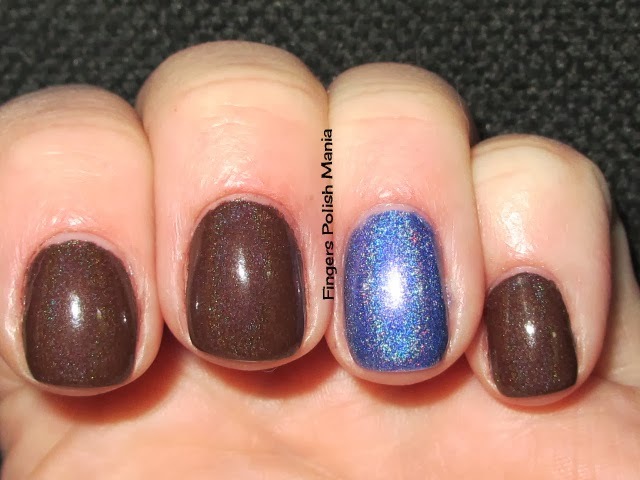 This is Liquid Sky Lacquer Forget Me Not and Chocolate Obsession. 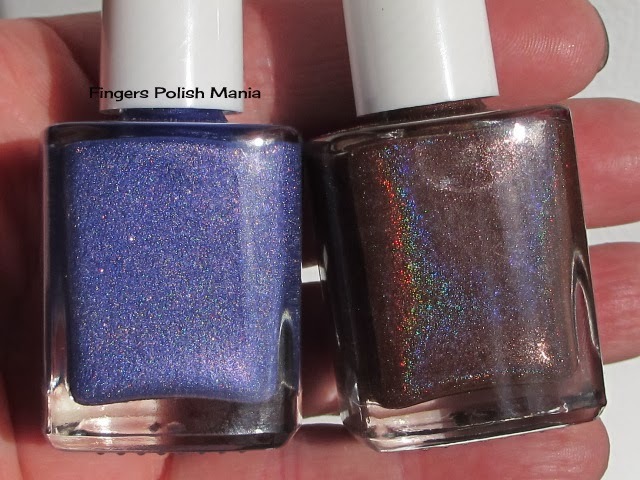 Yes I am in love with these two colors-I just wish the brown had more holo zing to it. 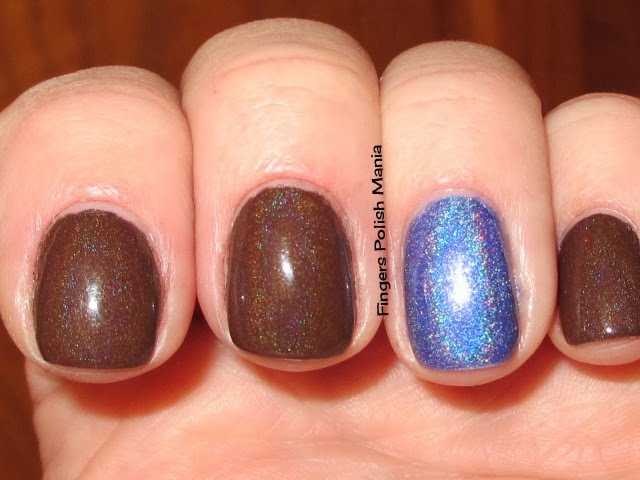 The next post will have nail art! WOOHOO! And a new nail shape-you see, my nails aren't meant to be squares even though I keep trying to do them this way. The issue is, I crack off the corners each and every time. I have given up on the squares.